"Unseasonable Weather Continues In The Northern Forest!" Even with the unseasonable weather, we were able to get in four good training days through the week. 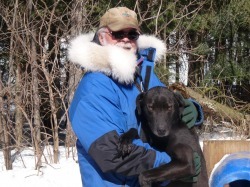 This week with all the upset going on here in North America, it is refreshing here to enjoy the simple uncomplicated life in the Northern Forest and playing with our Sled Dogs. This week, we started to introduce new dogs to the leader position with Tira (Big Kira) and Yoda getting their first opportunities up front for this season. They both did a great job and showing maturity over last year. Both dogs were very focused on running to the point that Tira prevented Venus from going off the trail to chase a squirrel that crossed their path. Today, we are experiencing high winds and chilling temperatures with the occasional snow flurry. However, the forecast for next week is again for warmer than normal temperatures. This week, we also moved some dogs around in the kennel to make things here more efficient. Even little Kira got a new home in neighbors on either side, front and behind her. She is getting less shy everyday. Tira is the black dog leading the team in the above video along with Venus.